Picture an average eight-hour day at the office. Now double that. That 16-hour period is still shorter than the time it takes to fly from Boston to Beijing, excluding a likely layover. While China is thousands of miles away, across an ocean and half a day ahead of us, a handful of Brookline, Newton and Lexington residents are attempting to bridge the two nations like never before. In 2005 Qiong Zhou, former principal of the Newton Chinese School, NCS, in Newtonville, started a program for 12 Chinese-American high-school students to help support poor Chinese high-school students living in rural areas. Called the Support Education Program, SEP, the mission involves NCS students fundraising year-round to collect money for these Chinese students living in dire economic conditions. This year, Brookline residents Ginger Yao and her daughter Jocelyn were among the 14 people selected to travel on the annual spring-break trip to China. Zhou started the program after learning of a trend where many parents in rural China would leave their kids behind to take jobs in bigger cities hoping to send money home. High school is not mandatory in China and parents were often unable to provide the necessary funds to continue their children’s education. This is where SEP steps in. The program provides money for the families so the students can graduate high school and go on to college. Revenue comes from various fundraising events such as bake-sales, talent shows, tennis tournaments, book fairs, concerts, dance festivals and donation boxes. The recipients of the funds are selected by their high schools, based on their academic achievements, their level of poverty and their future ambitions, according to Ginger. Each year, SEP brings between $12,000 to $17,000 to distribute among 20 to 30 students at schools in China chosen through a process drafted in the by-laws of the organization. Zhou recalled how one student did the math and realized his smartphone was worth more than a Chinese student’s whole family budget for a year. Another student realized that some students in China were wearing the same clothes the entire week while they were there. “One boy we met, his grades dropped because he stopped eating dinner to save his parents from having to pay for the food,” said Jocelyn. “While we were there we realized how privileged we were and how we can use that privilege to help others in life”. Parents who head to China’s big cities to take jobs often end up as construction, maintenance or migrant workers. During the trip, Jocelyn met a boy whose parents made a living picking up trash. She described the family as “the kindest people I have ever met”. Ginger, who serves as the program director, accompanied Jocelyn as one of the two parent-chaperones. Currently serving a two-year term as director, Ginger had been to China multiple times before this trip, but had never experienced a trip like the one she took with SEP. The trip allowed Ginger to see her daughter in a new light, not just as someone she is responsible for, but as an independent student and volunteer. In this way, and many others, the trip benefits all involved. Beyond the financial donations, the students partake in swap of cultural practices. 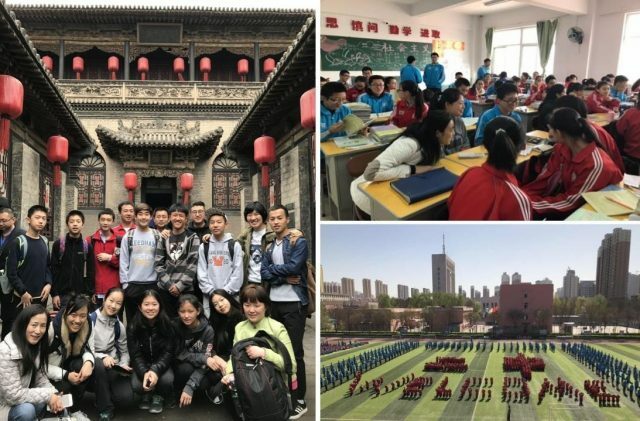 The Chinese students get a taste of life as an American teenager and the education process here, and the American students get a better understanding of Chinese culture. “We help Chinese students financially and they help our students be inspired and motivated by them, living in different conditions,” Ginger said. “This trip is transformative and we see our students find more meaning in their lives going forward”. Though far-reaching in the lives it impacts, SEP is a small program, which is exactly how the NCS intends to keep it, aimed to continue helping improve the lives of impoverished children across rural China. The effects of SEP are clear long after participants have passed through it, and sometimes the Chinese students will reach out to NCS after graduating high school or in college, expressing their appreciation and gratitude.